Q: Want to make a Patch? A: You already have my approval, just gimme a heads-up. A: I have done... nothing language wise other than description. Go right ahead. Q: Want to Port it to Oldrim? A: You will have my approval as soon as you formally ask for it. Q: Want to Port it to Xbox or PS4 on Bethesda.net? A: I already have a Bethesda count with mods. As soon as requests come in I will do this myself. Q: Want to use my mod a template for your own? A: Go ahead, i'm doing nothing other people haven't thought of either. Just ask me first if you template the ESP itself before you commit to release. -If bug, read details page then existing bug reports then post bug!!! ﻿Back up your saves... if you want to try it with an existing character (not recommended, abilities and powers will work. It is HIGHLY advisable to start a new game since actor values such as Health, Magicka, Stamina and Encumberance will not line up completely right even if you console "showracemenu" and then switch to another race and back to your prefered. 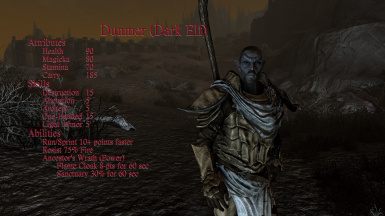 The real gameplay is with a fresh game and growing with it, loading to an old one will give you different abilities sure, but this mod was intended to make the beginning more interesting and unique as far as playing as a certain race was concerned. An altmer or bosmer may not want to run into a cave swinging in the open at level 1, but a nord or orc could get away with it. Think like the class you want to play but know what your body is capable of. 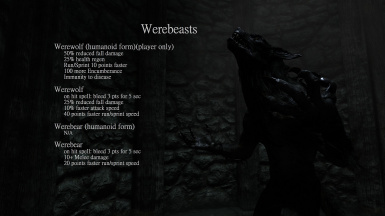 ﻿Considered an "upgrade" from KIWF - SSE - Races (this mod), This mod will be updated in accordance as needed. It is not intended to be used WITH this mod. ﻿No need to ask permission to make a PATCH, just send me a heads up. ﻿Will not be making Oldrim version (I miss the completed mods like Multirace adoptable children, Expanded Towns and Cities and Enhanced Behaviors, but i have had it with trying to play/edit parts of oldrim (for now...)), feel free to give me a heads up if you make a PORT and you'll have it. ﻿If there's even a few demands for Xbox or PS4 port, let me know and I'll upload it to Bethesda.net myself. I broke the unsung rule of "dont touch the Player actor" but it was the only way to remove the bonus to base stats since its only on the stat tab for the PC. This was the only way I could remove the vanilla handicap for player AND npcs efficiently. I tried adding a nerfspell to the player via pcstartquest but it gave red stat numbers all the time and that's not great. Anything that changes the vanilla playable races will not be compatable. Each section will list changed and specifically touched items that usually conflict with other mods. ﻿I really didn't... that's just what happens whenever anyone makes something that's a replacer and not a standalone. I recently replayed Morrowind, then began oblivion twaking away the wiffle batting away and was satisfied (KIWF-Oblivion). When I went to start Skyrim gave it a fresh install and began to download the usual mods I liked and looked for some new ones. I stumbled across Character Creation Overhaul by Synclonix and was blown away by their attention to detail. 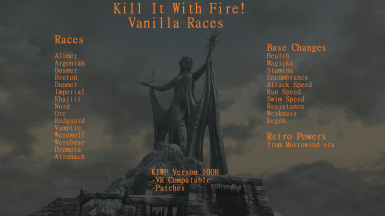 While I very much liked the idea, the scripts scared me a little so I sought to make a script free race mod that "shouldn't" be incompatable with anything apart from other vanilla race altering mods. ﻿Unlike Synclonix or Daiyus I will not be creating birthsigns because I feel the doomstones are good enough and classes are a bit restricting considering most people custom classed the older games anyway. I currently have no safe way to effectively implement a class system based on in-game choices so that is not yet implemented and when i do eventually, it will only give slight but effective bonuses of +10 and +5 for major and minor skill levels and 10% and 5% exp bonus for advancing those same skills (that is my plan anyway). 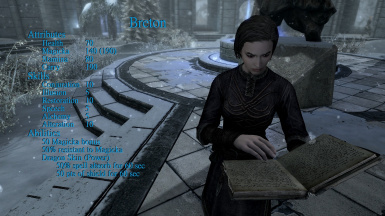 But my biggest reason for making my own race mod however was admittedly because script focused mods scare me as CCO took alot work to make stable with conflicts and bethesda's useless Creation Club updates to the exe. The OTHER my because OCD was going NUTS with the carry wt not lining up with stamina neatly... But the vanilla races are same-same and not unique so I wanted to get my fingers all up in them to fix it. 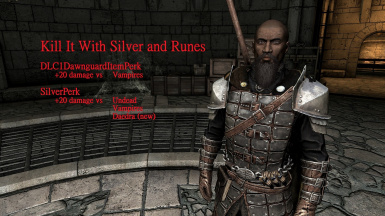 That being said, there are other character creation mods and such but this only changes races and if loaded after alternative start style mods it should still work just fine. 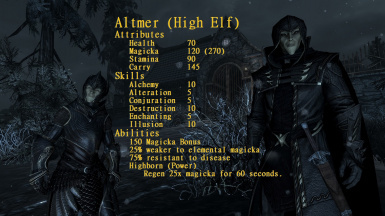 ﻿Since these attributes were NOT taken into accound when skyrim was in development, the races are all same-same and boring... other than looks and powers we SOMETIMES use, it probably doesent feel like we're playing differently with an dunmer than we do a nord. 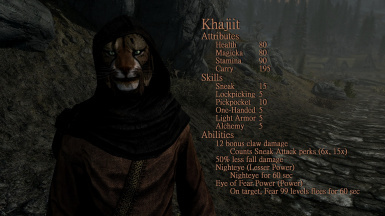 Not to sound racist or conformist but the races in TES V do not conform to a proper stereotype I think is needed to make a playthrough feel like you are a khajiit or orc. Or when you're fighting them, they're all the same. ﻿Going across the board, I looked at what the values were for each race between male and female and averaged them up. Pairing the above/below attributes together into neat numbers under the actor values they affect. Ie. 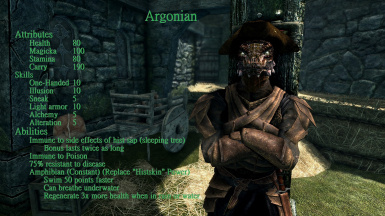 Argonain males have below avg willopwer so -1 but females have above avg intelligence so +1, in the scheme of magicka call this +0. Orcs have above average strength, willpower and endurace but low agility, for me this translates to +4 points to health (40) and +2 to Stamina (20). 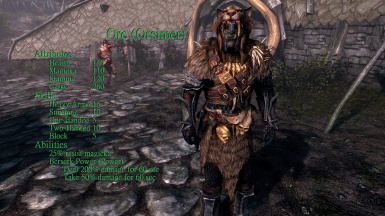 The orcs are all above avg strength and this affects damage, so 10% to melee attack damage as passive. ﻿Reminder: player conventionally started with +50 in all stats over npcs who only got the 50 base. This is no longer the case. 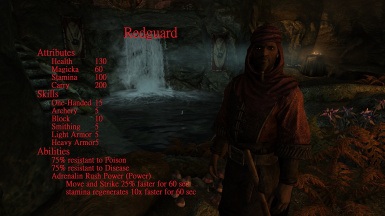 Player (actor), HighElfRace, ArgonianRace, WoodElfRace, BretonRace, ImperialRace, DarkElfRace, OrcRace, RedguardRace, nearly all spells for race abilities and powers as well as magick effects related. ﻿﻿Regen 25x magicka for 60 seconds. ﻿12 bonus unarmed damage, counts towards sneak damage perks. ﻿﻿Deal 200% damage and take 50% damage for 60 seconds. ﻿As you can see, an orc could probably pick up a bosmer and break them in half, if they could catch them that is. No race is really more powerful than any of the others, or so I've tried to do. They just have their physological niches based on their ancestry. It is worth noting now that... the player character has 50 pt bonuses to base stats over every NPC in the game. This is being negated by this mod. You will have as much hp as your enemies and in some cases less in the beginning just like the good old days. 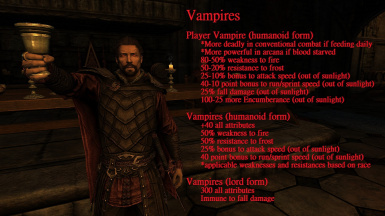 ﻿If you favoring another Vampire or Werewolf mod WILL override the changes so long as it includes the "tampered" items. Just place lower in load order than my pugin to block and override my changes. ﻿I never liked how the vampires and werewolves were... easy to kill. 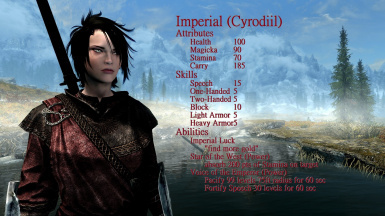 They were just buffed with no niche strengths or weaknesses like in morrowind and oblivion to make them interesting. Or somehting to be feared... Also: I tampered with the dawnguard and silver weapon perk which adds and negates damage on attacks. Just so we're clear... this is for enemies as well. If you're not gonna be playing as one of these things, you might feel a little bit like prey because the speed is much more different than wifflebatting hps and damage. ﻿The oblivion crisis was supposed to teach Tamriel that daedra were viable threats, hence Vigilants of Stendarr. 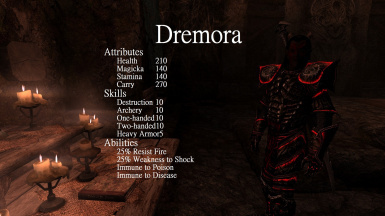 Dremora in particular. The Aureals and Mazken are not in my mod because alanovichromanov does a good job already. I just wish I was able to add the winged twilight mod to the leveled lists, but it would be a little out of lore because post-oblivion-crisis change the universal rules (at least thats why the mages guild doesent teleport anymore but the Psijics certainly don't seem to mind...) Anyway, I am however dealing with the Dremora... Basically they are an orc battlemage who you might want a silver sword for. They are not quite pushovers anymore but being a daedra they have their weakness to silver of mundus as they were in morrowind. They are resistant to fire but weak to shock. Just as they were before. Other deadra such as ash spawn, lurkers and seekers have not been changed. 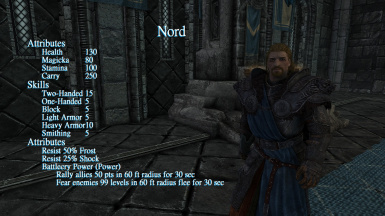 I have not yet added "Normal Weapon Resistance" but I am better simulating it in the Extended Version of this mod. ﻿In Morrowind (i keep going back there...) and in Oblivion (I keep going back there too...) The Daedra and attronachs could be a bit of a challenge depending on when you ran into them. 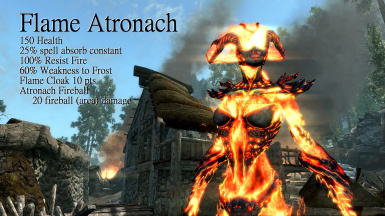 If you fought a flame atronach at level 5 in morrowind you better hope you had a silver weapon or a frost spell. even then it was dicey... in oblivion, it was almost standard to hit a flame atronach around or at 10 and it was quite doable. Easier with frost or a silver sword. In skyrim? level 1 and with an iron dagger would do the trick. Summonables are a joke but at least they're a distraction. 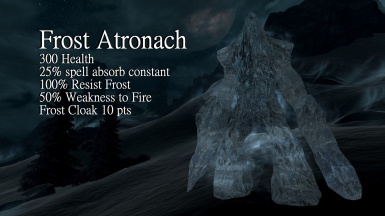 As a ally or foe, atronachs were fairly simple. What I am doing is mostly revisiting their weaknesses, I am not yet tampering with HP and normal weapon resistance yet. Texture mods will all work with them, no worries. But their stats are changing. 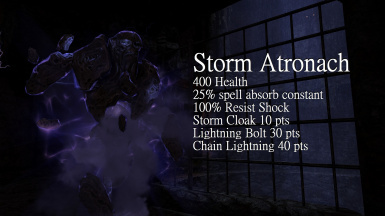 Encountered and summoned Atronachs will have more health only apreciable at lower levels, 25% absorb magicka.